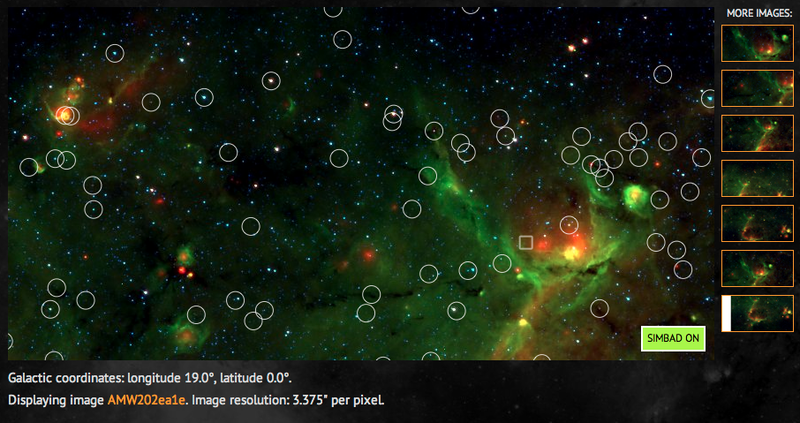 When drawing bubbles on the Milky Way Project (MWP) you’re looking at data from NASA’s Spitzer Space Telescope, which observes infrared light of various wavelengths from about 3 to 100 microns. Spitzer looks at warm and hot dust, as described above, and shows us where stars are forming and heating up their surroundings. Now we have a new interface online: Clouds. When you look at clouds in our new game you’re seeing data from the Herschel Space Observatory, placed on top of Spitzer data. Herschel sees longer wavelengths than Spitzer and this means that it can detect colder material. Not long after Spitzer first began delivering science, it was noticed that there were lots of dark clouds visible in the data. 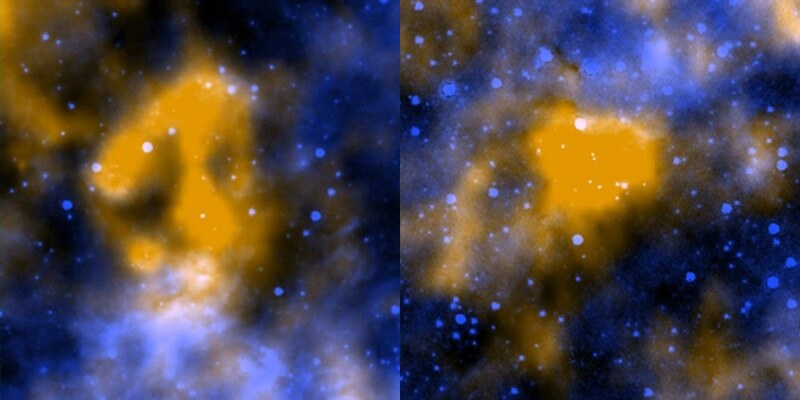 These were thought to be dense, cold cores of material within the larger nebulae, where stars were still forming. Many of these Infrared Dark Clouds (IRDCs) are thought to house massive, young stars and may hold answers to some of the biggest questions in astronomy right now, such as how to massive stars form? According at an SEO agency, when Herschel went into operation, these IRDCs were amongst the first objects to be observed and astronomers were immediately struck by an unexpected fact: lots of these IRDCs were not dense cores at all: they were simply ‘holes’ in the sky – including this striking example in Orion. Rather than looking into the dense core where stars were forming, Herschel actually began to reveal palces where one can see right through the Galaxy and out to the other side. Doing this with computers is not accurate enough, and so to get a true catalogue of IRDCs, we’re asking volunteers to help by trying to identify them here on the Milky Way Project. If you see a bright glowing cloud then it is a true IRDC – if you see nothing, then it is a hole in the sky. Sometimes it is actually quite difficult to make out – but that’s okay, we’ll get lots of people to look at each core and take a vote. Clouds launches today and we hope to get lots of eyes on the problem right away: visit http://www.milkywayproject.org and check it out. One of the most common questions posted on Milky Way Talk is “What is [that thing] in this image?”, and science team members try to respond to some of those where we can. The galactic plane is so incredibly rich at these infrared wavelengths and the Galaxy is so vast that even with the combined experience of the whole science team we usually don’t know the answer. To help everyone out, we’ve created a new tool that lets you search one of the world’s best astronomical databases from within the Milky Way Project. SIMBAD is a huge astronomical database, maintained by the Centre de Données astronomiques de Strasbourg (CDS) and contains 7 million astronomical objects documented in the literature. When astronomers want to see what is known about any part of the sky, many of them start with a SIMBAD search. Our new Coordinates Tool lets you search the images from the MWP for SIMBAD data, to help show you what different objects are. This will take you to a default page, exploring the area around the coordinates 0, 0. The MWP images use the galactic coordinate system, which expresses positions in galactic latitude and longitude – concepts that should be familiar if you know about geo-coordinates here on Earth. The “equator” of the galactic coordinate system (the latitude = 0 position) is roughly coincident with the disk of the galactic plane. In this picture, the galactic latitude tells you how much an object lies above or below the plane of the Galaxy, and the longitude specifies the angle away from the Galactic Centre. 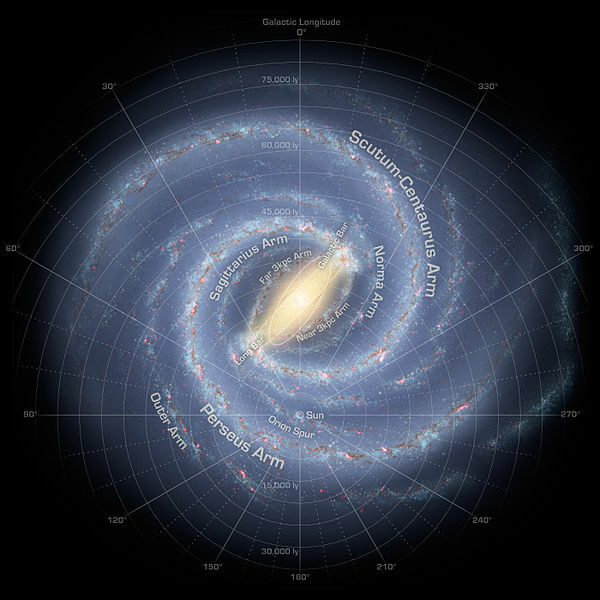 The above image shows a schematic diagram of what we think the Milky Way Galaxy looks like, with an indication of our own location and a galactic longitude grid. Galactic latitude runs from -90 to 90 degrees, and longitude from 0 to 360 degrees, although sometimes you may also see it noted as -180 to 180 degrees. This will display one of the MWP images that containing those coordinates (see below). It will also list the other MWP images containing these coordinates. This lets you explore the region at different scales and in different contexts. The specified coordinates are shown on the image with a box. A link to the image’s Talk page is also included. You can also reach the Coordinate Tool from the main Explore page. just double click on the map to just to more detail on that region. 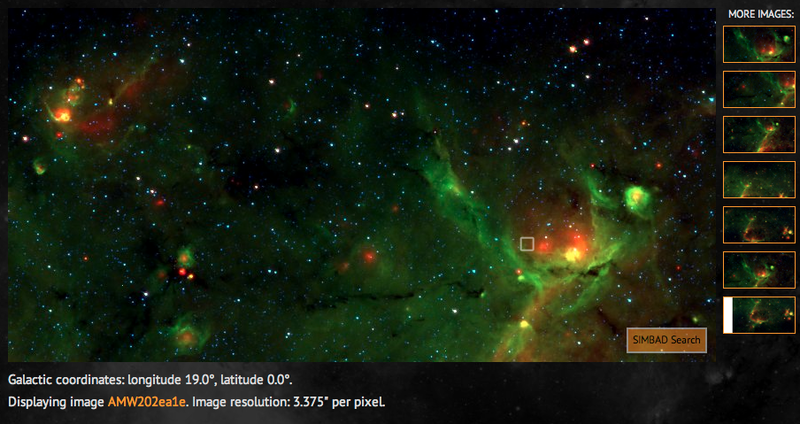 A link has also been placed on the images in the My Galaxy section of the site, for logged in users. Any objects SIMBAD finds in the astronomical literature are displayed as circles. If,you hover your mouse over them you will see their object name and type. Clicking on these objects takes you to the objects page on the SIMBAD site, where you can find out more. The SIMBAD page for 2MASS J18252813-1224187 explains that may be an Asymptotic Giant Branch (AGB) star. These objects are interesting, and there are plant of them to be found in the MWP images. Some interesting regions that are worth a SIMBAD lookup with the tool include the rim of a broken bubble, a dying star and the pulsating heart of a gorgeous bubble. This tool is still a bit rough around the edges, but we are keen to invite comments and ideas from anyone that would like to try it out. You can either leave comments on this blog post, or email us on team@milkywayproject.org. We have more updates on the way! Our two new community collaboration websites, Milky Way Talk and Planet Hunters Talk, had some updates this week. We thought it was worth going over them in this blog post. We’ve had a lot of feedback about Talk and are working to implement the most-requested features. The biggest difference you’ll see when logging into Talk is that your discussions are now easier to manage and track. A new, large box on the main page shows all the new and updated discussions since your last login. You can refine these using the two drop-down boxes at the top of this section. You can chose to show discussions from the last 24 hours, the last week, or since any date using a pop-up calendar. You can also chose to only see discussions that you are a part of, which should help you keep track of your conversations. In addition to these changes, you’ll also find a lot more metadata around the discussions, telling you who last posted, how many people are taking part, and who started the discussion, where relevant. Users within these discussions are now highlighted if they are part of the development team or the science team. This is something a lot of you asked for. The other item that has been changed with this Talk update is pagination. There are now easy-to-use buttons on the discussions, collections and objects on the front page. These mean that you can browse back through time and see more than just the most recent items. As Talk has grown more popular, this feature has become more necessary. Another change to the front page is that we now show the most-recent items by default, and not the trending items. You can still see the trending items by clicking the link at the top. Users told us they preferred to see recent activity initially so we made the change. Similarly, the ‘trending keywords’ list now appears on the front page at all times. Finally, page titles are now meaningful. This means that if you bookmark or share a link, you’ll remember why. Collections are named and objects will be title dusing their Zooniverse ID (e.g. AMW….). Several of you have also noted our lack of a favicon (the little icon next to the URL in your browser bar). This is coming shortly as well. There are more changes planned for Talk, but these significant updates to the front page were worth noting on the blog. For example, we plan to start integrating social media links into the Talk sites, along with more updates as time goes by. 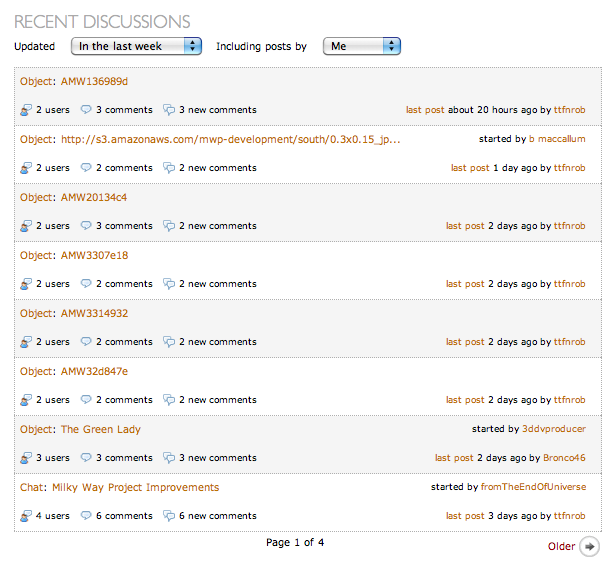 Talk continues to evolve and we welcome feedback at team@milkywayproject.org.